Merry Christmas! Halloween is still the best. Merry Christmas! Although Halloween is still the best day of the year, we hope you’ll take the time to celebrate with your family and friends. Spending time with loved ones is always a treat – especially if they share your freaky love for Halloween! Who knows? You might need to exercise your close bond with friends and family when the zombie apocalypse finally comes. You’ll need all the help you can get. Whether you’re digging into Turkey, chasing after brains or fighting off vampires with a candy cane stake, we hope you’ll Celebrate Christmas, Halloween Style! 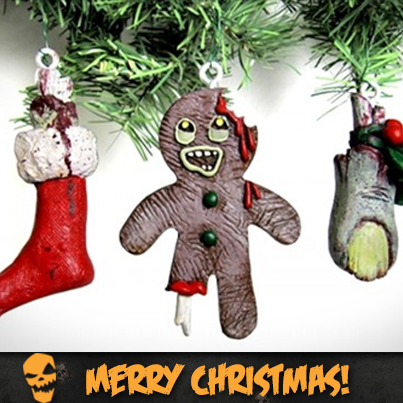 We wish you a scary Christmas, and a haunted New Year! 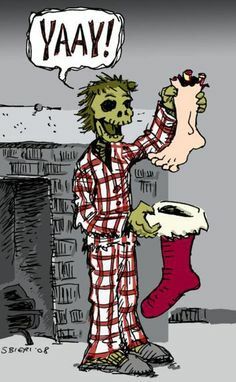 Good hauntings at Christmas, and a haunted New Year. Oh bring us a froggy pudding, and then disappear! Win Tickets to See Star Wars: The Force Awakens! Top 5 DIY Pet Costume Ideas For Halloween!